Review: Romeo and Juliet. Spotlight Theatre Company. – East Midlands Theatre. 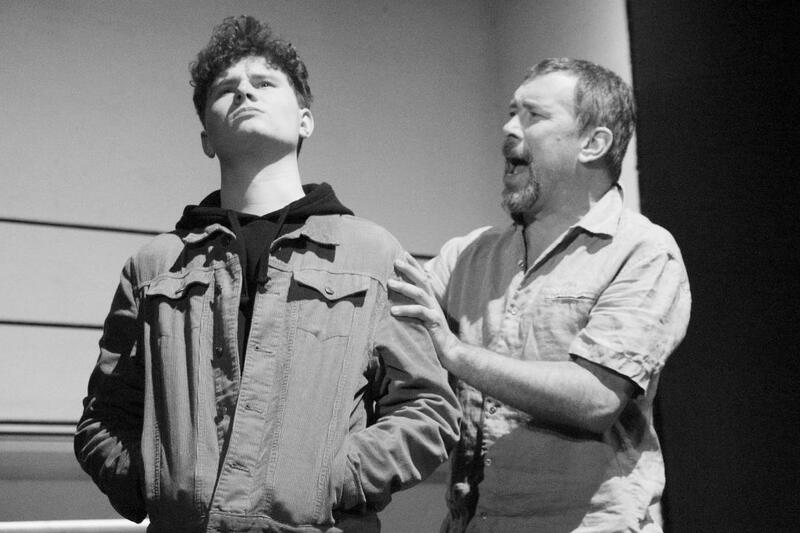 A few years ago William Shakespeare’s ever popular A Midsummer Night’s Dream was all the rage with the RSC using amateur casting for the Mechanicals and seemingly endless productions bursting forth all over the country. This year the Bard’s most popular romantic tragedy Romeo and Juliet is gaining a similar theatrical foothold. 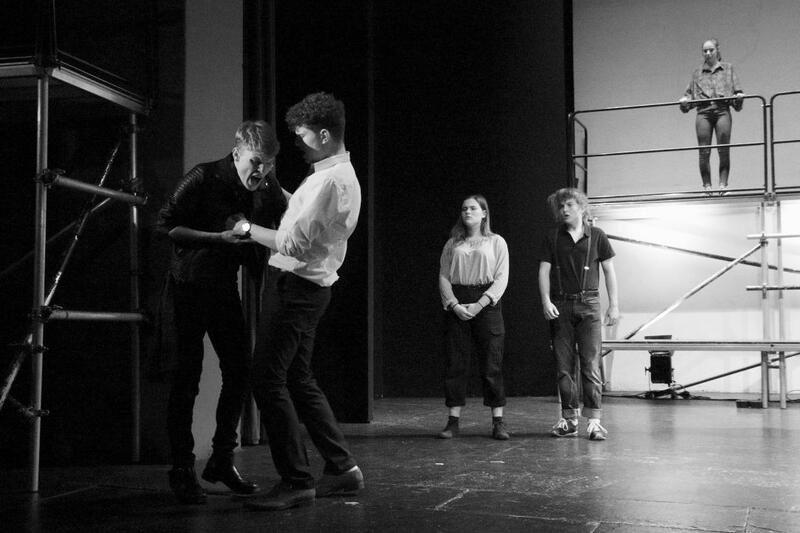 The RSC are once again using talented amateurs in a touring production and Matthew Bourne is in the midst of creating a brand new Romeo and Juliet ballet. 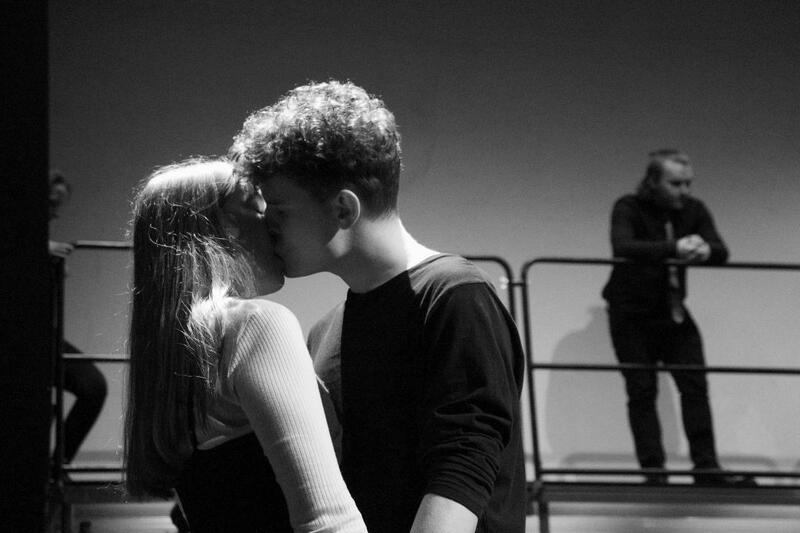 Presently, in Nottingham, the Spotlight Theatre Company are offering us a pared down modern take on the story of the star crossed romantic icons. Cassie Hall’s sharp direction has focus and invention. This production has a but a short run at Nottingham Arts Theatre from Thursday 7th Feb to Saturday 9th. Director Cassie Hall and her creative team set the play in a world of scaffold towers thus creating opportunities for playing at different levels and creative ways for actors to get on and off stage. 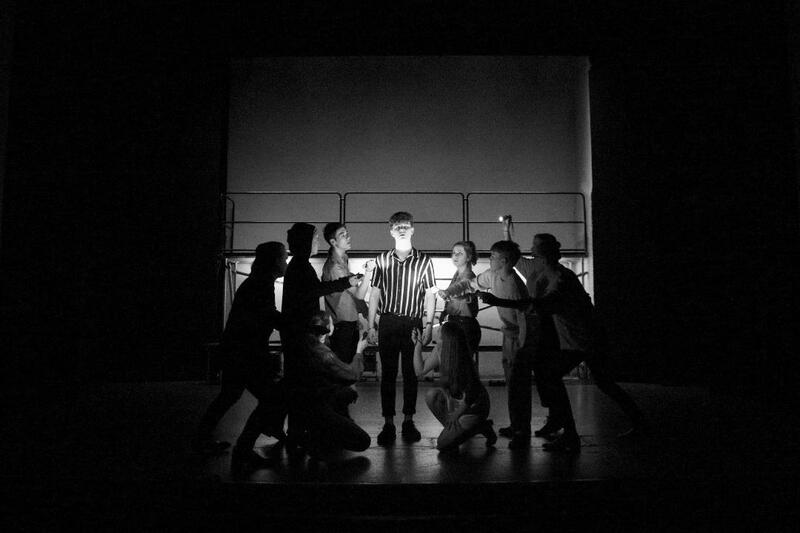 Tom Mowat’s lighting design helps to create mood changes and accentuates the fast moving action on stage. Rob Goll is the only older actor in the cast and his professional experience, gravitas and humanity offer inspiration for the younger players. His sober prologue solidly sets the scene for us in this stark metallic version of Verona. Goll also plays Friar Laurence with great warmth and affinity. 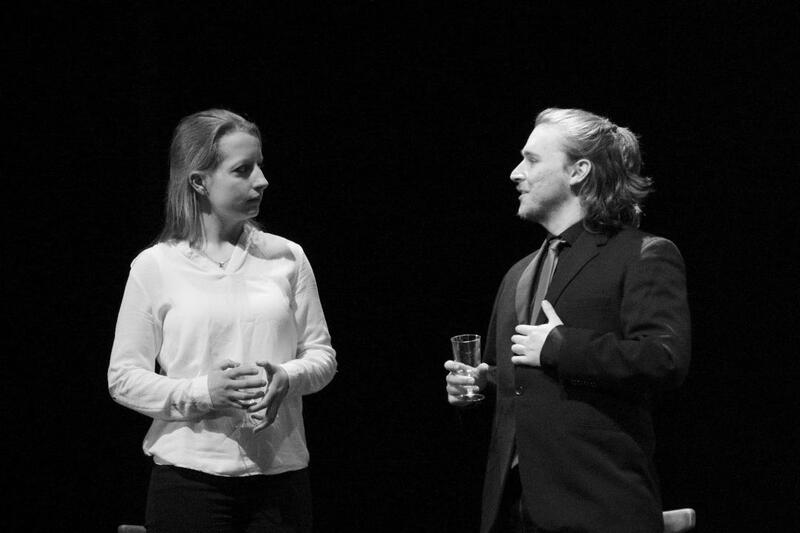 The cast of twelve give us an engaging and fast paced two hours traffic on the Nottingham Arts stage and on the whole Shakespeare’s words are spoken with clarity and understanding. The surprise of the evening is the casting of Mercutio (Joseph Stafford) as a cross dressing minister of camp revelling in his poetical bravado. Stafford shows great confidence and stage presence as he demonstrates his part phenomenally. It is almost a shame that he has to leave the stage when he dies. 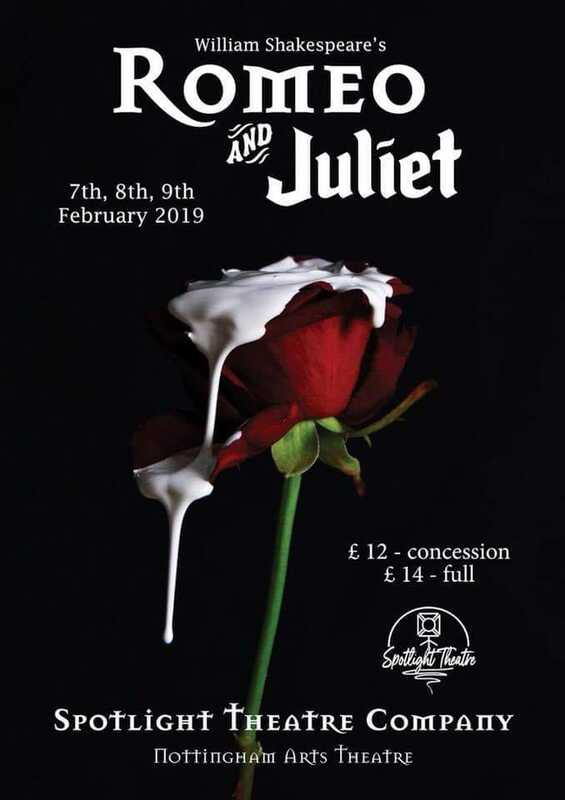 In the lead roles of Romeo (Stan Cook) and Juliet (Emma Gregory) both age appropriate actors demonstrate real feeling for their parts and a commendable command of the prose and verse. Gregory in particular has the unblemished sweet face of a fourteen year and her Juliet betrays an ignorance about the world of men; so much so that one wants to protect her from her fate and her, so called, disposition to be married, so ludicrously young. Such is the strength of Cook and Gregory’s acting one genuinely feels for this doomed romantic pair. This prior knowledge that we already possess about Shakespeare’s characters in Romeo and Juliet, if not from past productions historically since the 1600s then from film adaptations and ballet versions, is a curious one. Even at the start of the play we are told the outcome of the story. Romeo and Juliet are tragically going to die in order to bring civil order to the warring Montague and Capulet families. Shakespeare then throws us headlong into the hot beating heart of the past to tell his story post prologue. With this youthful cast playing ages right across the board it takes a little while to realise the age differences of the characters they are playing. Patrick McChrystal’s Lord Capulet shows great authority and danger; Jess Gale’s Nurse brings out plenty of cheeky humour in her playing of the role; Kim Allsopp’s performance of Lady Capulet has a commendable maturity and Adam Rhodes shows great theatrical promise in the dual roles of duty bound sop Paris and especially his fiery Tybalt. This modern dress presentation is certainly worth checking out and the energy with which it is played is certainly no ‘tedious tale’. Indeed, it proves itself very capable in encouraging young people to engage whole heartedly in a classic tale of cosmic orders, fate and ultimately, tragedy.